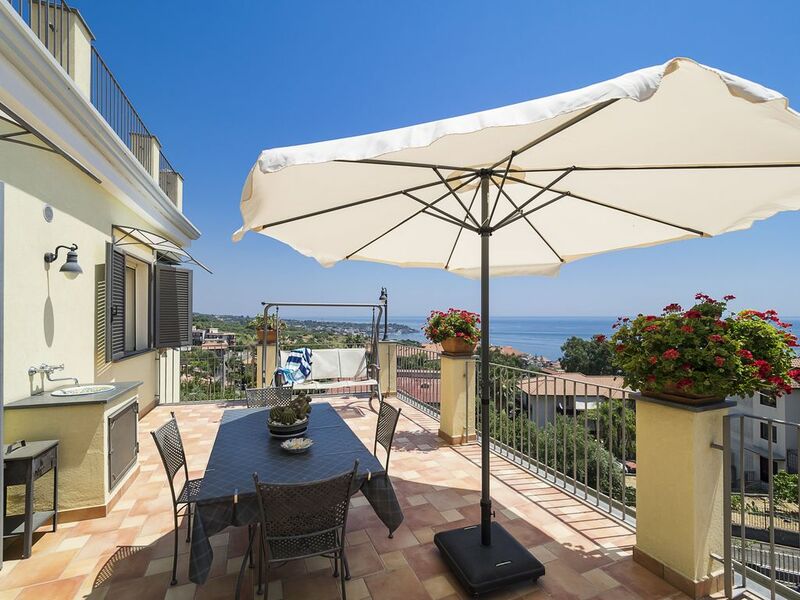 A tastefully furnished apartment with stunning views, situated on the coast of Acitrezza, 500 meters from the sea. Acitrezza lies halfway Catania and Acireale. Casa delle Alohe is located on the first and upper floor of a recently built villa with a magnificent view. The bright living room has access to the terrace with sea view, furnished with a rocking chair and a table with chairs. Stairs lead to the roof terrace with deck chairs and a 360-degree view, perfect for sunbathing. Casa delle Alohe consists of a bathroom with shower, bidet and toilet, living room with a comfortable sofa, an open kitchen with dining table and a double room with stunning sea view. The presence of central heating and the sunny, south facing, position makes it ideal for a stay at any time of the year. Acitrezza: Acitrezza is a charming fishing town, still relatively untouched by tourism except during weekends when it fills up with people from Catania in search of the sea. In summer Acitrezza becomes more fashionable and busy, with some nice bars and many restaurants. Near Acitrezza are the volcano Etna, the baroque town Acireale, the picturesque fishing village Santa Maria La Scala and the city Catania with its beautiful squares, main street Via Etnea (shopping area) and ‘must see’ fish market. Taormina is a short drive up the coast and Siracusa is about an hour's drive away. If you have a small car you can park inside the property. Alternatively you can park on the street. Two big terraces, one on the roof top and the other right in front of the living room. Casa delle Alohe is at 500 meters from the sea and from cafes and restaurants. But you will enjoy also to stay at home on one of the two big terraces, both with an incredible sea view! Wifi is available and included in the price! Diese Wohnung ist ein Traum. Schon der Empfang von Herrn Toressi und Jano war sehr warm und menschlich. Wir waren nun schon zum zweiten Mal da. Das frische Obst, die Flasche Wein und andere Überraschungen macht den Urlaubsstart perfekt. Die Gastgeber sind sehr herzlich und hilfsbereit. Die Wohnung bietet alles, was man braucht, ist sehr modern und gehoben eingerichtet. Die Bilder spiegeln das wieder. Der Sonnenaufgang direkt vom Bett über dem Meer zu beobachten war traumhaft. Perfekter Ausgangsort um sowohl Taormina, Acireale, Catania, Messina und natürlich den Etna zu erkunden als auch zu Baden, das kleine Dorf und die Menschen kennenzulernen. Plaza Duomo ist auch zu Fuss gut erreichbar. Wir sind sehr gerne die kleinen Gassen runter zum Strand oder für kleine Einkäufe gelaufen. Die fahrenden Gemüsehändler bieten frisches Gemüse zum günstigen Preis. Wir können das nur weiterempfehlen. Ein Tipp: für Menschen mit empfindlicher Haut gibt es auch einen kleinen Sonnenschirm für den Strand. Hier würde wirklich an alles gedacht. Wir kommen auf jeden Fall wieder! Einen großen Dank an alle für den sehr schönen und erholsamen Urlaub. The apartment was fabulous, bright, clean and everything you could want for a holiday. We had two weeks and wished we had booked for three. The views are spectacular and location ideal for visiting sites of interest. The town Aci Trezza is lovely in the evening, and plenty of restaurants to choose from. We loved Aci Castello and the castle and square a lovely place to sit and have a drink or food. So many places to visit, Syracuse and it’s “island” is a good day out and the modern cathedral spectacular. Mount Etna has to be done! Riposto is interesting and a good walk along it’s coast. Giuseppe and Jano, the owners, were so welcoming and helpful and we certainly recommend their apartment. After a one week, 10-person family vacation on the west side of Sicily, my husband and I couldn't have found a better way to spend the 2nd week of our trip alone. This apartment is exactly as described, but the views (sunrise is spectacular) are better in person! Aci Trezza is a great village with plenty of restaurants and cafes right in the harbor. This location is perfect for touring all of the sights on the east coast of Sicily (Etna, Taormina, Ortigia/Siricusa). Technically, the apartment is walking distance to town, but the walk is better suited for the physically active, as the return to the apartment is windy and uphill all the way:). Also, make sure your manual transmission skills are sharp! Giuseppe and Jano were wonderful hosts and we look forward to a future visit to Casa delle Alohe! This is a 5 star review. Arrival and meeting the brothers was easy and went like clockwork. The apartment is almost exactly as described and the accommodation is faultless. Why almost? The loungers in the photo were not present, although a pair of reclining chairs were. The terrace faces east and is a delightful location for breakfast watching the sun reflected in the sea from the shade of the umbrella. We were there in a heat wave, so it may not be typical, but we were driven indoors by the sun after mid morning, but we could emerge again in mid afternoon when the terrace is in shade. Sun lovers can move to the roof if they wish, its in sun all day long. The air con is only in the living room, but with the bedroom door open and a fan in operation the bedroom was never too hot. It's difficult to be sure, but the area appeared to be a mix of holiday apartments and permanent residential. The neighbours were entirely Italian. We never walked into town, too hot, but it is a very short drive and parking is ridiculously cheap. We thoroughly enjoyed our stay in this property and the contacts were extremely helpful in giving information on places to visit and eat. We would have no hesitation in recommending the property to family or friends and would definitely stay there again when returning to Sicily. Acitrezza is an excellent base from which to explore Mount Etna and its surroundings. The villages of Etna, such as Trecastagni, Zafferana Etnea and Randazzo, are famous for their ancient lava flows, the architecture of their seventeenth century churches, their delicious local produce and the hospitality of the villagers. Situated 700 metres above sea level, they are a favourite retreat of the city dwellers who, in summer are in search of cool, fresh air, while in winter are in search of snow for skiing. Few people are aware that Etna is a popular location for skiers in winter. On some glorious days in winter, it’s even possible to ski the frozen slopes in the morning enjoying a wonderful panoramic view of the Mediterranean, and then, the same afternoon, go and sunbathe on the beaches below! Rates include access internet, final cleaning, linen and towels, water, gas, electricity and use of air-conditioning. There are no hidden extras.Security deposit = 150 euro.